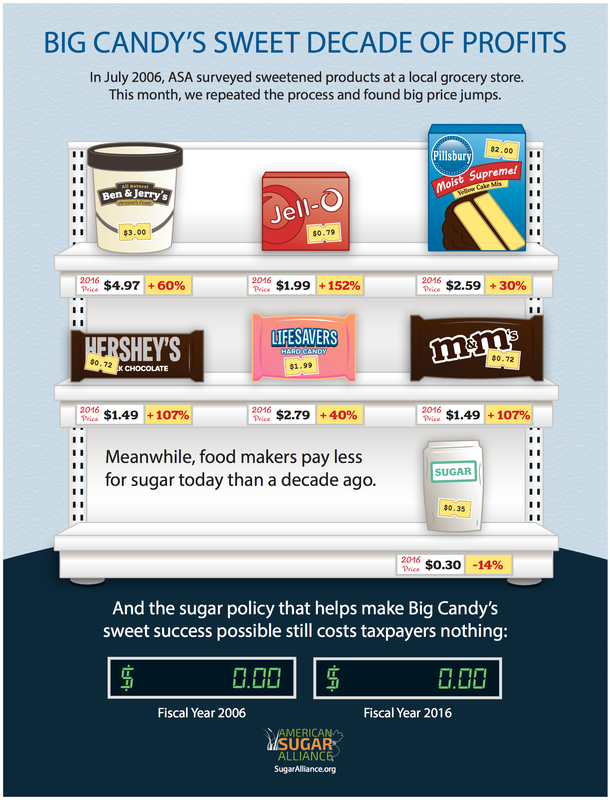 Coeur d’Alene, Idaho—Grocery shoppers with a sweet tooth are paying more than double what they paid for a candy bar 10 years earlier, even though the sugar in that candy bar is cheaper today than a decade ago. That’s according to an annual survey of sweetened product prices conducted by the American Sugar Alliance (ASA). ASA first published its survey at the 2006 International Sweetener Symposium. Results of the latest survey were made public today via an infographic at the 2016 International Sweetener Symposium. Other products surveyed by ASA included ice cream, which is 60 percent more expensive than 10 years ago; strawberry gelatin, which is 152 percent more expensive; hard candy, which is 40 percent more expensive; and vanilla cake mix, which is 30 percent more expensive. Meanwhile, the price that food manufacturers pay for sugar has declined by 14 percent over the same period, according to USDA data.